The United Bldg. Condos is one of the most anticipated new condo launches of 2019, and for good reason. 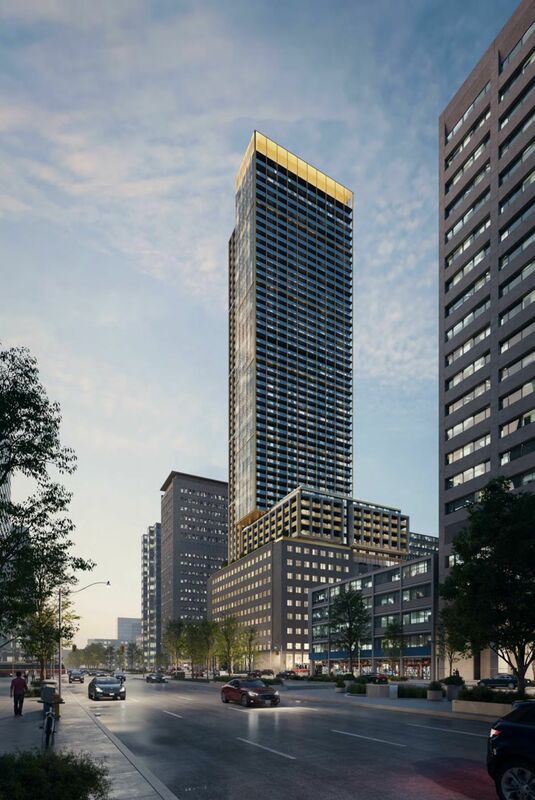 The project is located in true AAA location in Downtown Toronto at University & Dundas, with direct connection to the Subway (which Barbara Lawlor refers to as “gold dust”). 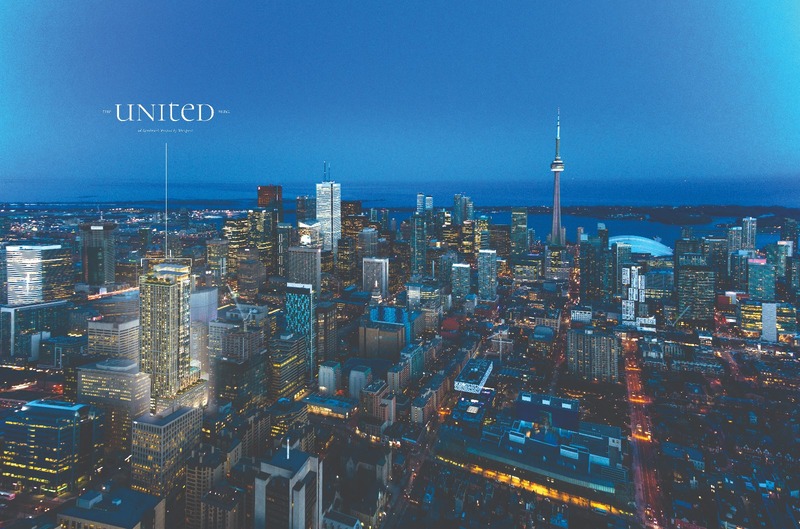 Located at 481 University Avenue, United Condos offers a very rare University Avenue address. University Avenue is home to Queen’s Park, many commercial buildings and Hospitals. The United Bldg. 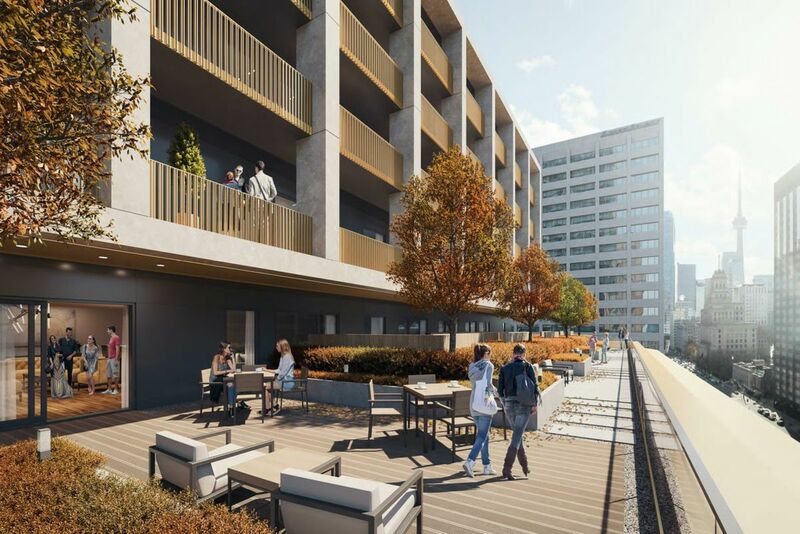 is located in the Hospital District of Toronto, offering unparalleled access to some of the worlds finest Hospitals and research centres, giving investors access to one of the best tenant pools available in the City. United will be launching on March 27. Register below for first access! United Launches on March 27. Click below for Guaranteed First Access! Amit Bhandari: Hi, everyone. This is Amit Bhandari of talkcondo.com, and today we are at Baker Real Estate HQ, and we are with an extremely, extremely special person. This is Barbara Lawlor. Now, she is the president and CEO of Baker Real Estate, like I said, but Baker Real Estate is probably one of the largest new home sales companies perhaps in Canada, but not only that, she’s also one of the most influential individuals in our space. Barbara, thank you so much for allowing us to interview you. Barbara Lawlor: My pleasure, and thank you for the wonderful introduction. That was very kind of you. Amit Bhandari: Well, you are. So like I was mentioning that you are probably one of the most influential individuals in our industry, it’s a real pleasure sitting with you, and it’s also something that not a lot of people tend to get an opportunity to do, especially our audience. They don’t get to directly interact with you, and you’ve been doing this for a couple of decades now. Barbara Lawlor: Decades, yes. Yes, indeed. Amit Bhandari: I believe you’ve been with Baker Real Estate since 1993. Barbara Lawlor: That’s when the company started. Amit Bhandari: Amazing. Can you tell us a bit more about this journey, a little bit? Barbara Lawlor: Yes. I actually started in sales with the company, and it was an extraordinary journey as I became more aware of the new construction industry, and then moved into that in sales, and when I started, condominiums were 5% of the overall market. Can you imagine? We are constantly in the last few years outpacing all other arms of our real estate industry, and we’re always well over 50% of the annual sales in our industry in each year, so it has grown tremendously, and it’s so exciting to see how Toronto has changed over those decades, and to know we sold that building. “Wow, look at that. It got built and it’s beautiful and it’s got presence on the street,” and we have the pleasure and the honor of being involved with some of the most iconic buildings in Toronto. It’s really exciting. Amit Bhandari: Amazing. I’m glad you brought up the Toronto aspect because Baker Real Estate, you yourself, in this very room, you’ve probably had some of the most important meetings, a lot of which have perhaps even shaped Toronto, I’m sure, right? You’ve worked with some of the best of the best in terms of developers, and you briefly mentioned and touched on the decades of work that you’ve done with developers on Toronto. I’m curious to see, because you’ve seen what it was and what it is today, what’s your take on it? What’s your take on Toronto today, and what is your take on Toronto five years from now, ten years from now? Barbara Lawlor: Yes. Toronto has a long way to grow, even though it is a very exciting and emerging as an international city right now, but I really feel that the future is extremely bright for Toronto. We are attracting so much immigration, so much interest and focus from the rest of the world that this will grow our industry, and if you look at any great city in the world, it attracts investors from all over the world like New York, like Paris, like London. Great cities attract investors to their real estate, and we’re doing that, and that partly goes back to our immigration because immigration is such a strong, driving force for us in Canada. Barbara Lawlor: Almost every one of us were born somewhere else, and we all come into Canada believing in brave new world, and it’s true, and because of that, we bring the eyes of our parts of the world together, and it’s really focused in Toronto. I believe so strongly in the future of Toronto as a great international city. Amit Bhandari: Amazing. I think you’ve touched on a couple of amazing points in the immigration factor. I think the other really important piece is the fact that Toronto sometimes for brief periods suffered from a lot of brain drain. There was a lot of talent that, say, great institutions like York University, U of T, Ryerson, phenomenally talented individuals, but they were looking elsewhere for work, perhaps, but now the fact that we have all this investment coming into the city, we’re retaining a lot of that talent. Barbara Lawlor: Yes, and some of it is coming back. Amit Bhandari: Yeah, and some of it is coming back, too, and the immigration aspect as well. We are attracting the best of the best now as well, and that all ties back in to say the investment angle where you’ve got all these global companies that are looking at this with a keen eye and seeing that Toronto is now the place to be in, and they’re moving back into Toronto or moving new headquarters into Toronto as well. Barbara Lawlor: Yes. It’s so exciting. Amit Bhandari: It is very exciting. Barbara Lawlor: It’s great to be part of that, and I’m sure you feel the way I feel at every day, because in real estate, we are 24/7, and it’s the last thing I do before I go to sleep, and it’s the first thing I do when I get up in the morning. It’s a really exciting industry, and I really believe in it, not just as an investment, but it’s people’s homes. People live in these wonderful places. First time buyers get their first taste of investment, many of them, with Toronto real estate, so there’s something for everybody, something for every pocketbook, something for every investor, no matter how sophisticated or how preliminary the investor is. It’s a very exciting industry and a very exciting city. Amit Bhandari: Amazing. We are in 100% full agreement with you. Barbara Lawlor: I’m sure you are. Amit Bhandari: We’re huge, huge fans of this city. Huge fans, and we just want it to succeed in every way possible. Barbara Lawlor: Yes. We’re on the same page. Amit Bhandari: Amazing. The next bit I want to get into is we’ve looked at the city as a whole, and I want to drill it right into University Avenue. Amit Bhandari: Oh. I like that. Amit Bhandari: It’s one of my favorite roads. Amit Bhandari: It’s beautiful. I think it’s so beautiful with the war memorials in the middle, but there’s so many different aspects of University Avenue that I don’t think get touched on as much as it should. I know that it’s known heavily for the hospitals. It’s a huge aspect of University Avenue, but I think a lot of people forget that there is the University of Toronto aspect of it. There is the MaRS aspect of it. There’s the arts and culture. There’s the beautiful war memorials. What can you tell us about University Avenue? Barbara Lawlor: Well, what I’d like to say is that when I’ve traveled throughout the world, you go to great cities and you see these beautiful avenues. Well, University Avenue is ours. It’s like right from Queens Park, from Queens Park down, it really just locks our avenue into place. Amit Bhandari: And there’s so much presence, right? Barbara Lawlor: Yes. Tremendous presence, and it is a generous avenue, and like you say, the memorials and the designs and the landscaping as you drive down that avenue, it’s particular in Toronto. There’s nothing like it in Toronto. It’s a spectacular avenue, and it is relatively rare to get a residential address on this avenue. Amit Bhandari: The Four Seasons. Barbara Lawlor: Yes. Science. Everything. Amit Bhandari: Research and development. Barbara Lawlor: That’s not all, because you are walking distance to so much else. Walking distance to lifestyle that are wonderful restaurants, wonderful art galleries, wonderful shops, trendy, cool, just there is so much. You can walk to the Eaton Centre, and the Eaton Centre has so many marvelous brands represented in it. There’s everything is either within walking distance or, of course, within transit, and we have direct access to the subway. That’s gold. Amit Bhandari: I know it is. I’m going to pause a minute because that’s a really, really important piece. One thing you mentioned that I think is incredibly important to highlight, once again, is the rarity of a new building coming up on University Avenue. Barbara Lawlor: Yes. Very rare. Barbara Lawlor: Yes, they do. Yes. Amit Bhandari: They need to live close to where they work because of the nature of their work that they do, and this is a really, really important piece, and now I do want to jump into United, which is the major topic of the discussion for today. 481 University Avenue, there’s some incredibly unique aspects to this building. Number one being it is a rare opportunity. You don’t get many opportunities. Barbara Lawlor: No. Address and location. Amit Bhandari: The address, location, yes, absolutely. The design, the architects that are involved. There are a couple of things that I want to very briefly touch on. B+H, the architects. Barbara Lawlor: The architects. They have had their hands in so much of Toronto’s iconic skyline. Amit Bhandari: They’ve practically developed the skyline. Barbara Lawlor: … commercial buildings, yes, that that dot, that standout, that … Like the CN Tower. Barbara Lawlor: The ROM. Yeah. There’s so many. Amit Bhandari: Eaton Centre, I guess. Amit Bhandari: Heritage [crosstalk 00:12:42]. Barbara Lawlor: … restoration of the heritage. The heritage aspect of this building is the largest in North America. In North America. That’s really saying something. So it’s quite interesting. What they’re going to have to do is to maintain the structure, the outer structure of the building. Of course, they’ll beautify it and restore it, but they’re going to have to keep the exterior, and they’re going to have to go down through the rest of it and go underground and then come up from there and restore it and rebuild it, and it’s quite extraordinary what the process is going to be. Amit Bhandari: There’s only so many … I’m sure there’s only so many architectural firms that can perhaps do something like this, as well. Barbara Lawlor: Yes. I agree with you. They are rare, and rare is a word that occurs a lot when you’re talking about the United Bldg. 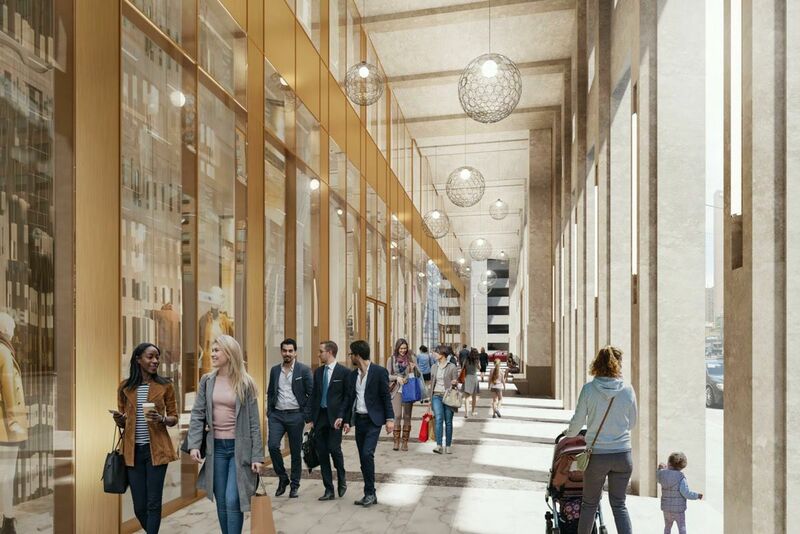 What they’re going to do with the restoration of the heritage part of the building is they’re going to create a colonnade at ground level that … I mean, the renderings are so beautiful. Amit Bhandari: They are stunning. Barbara Lawlor: It’s like you’re in London, you’re in New York. You see these marvelous colonnades that are beautiful shopping, and just it’ll elevate our city so much. Amit Bhandari: I especially love the gold accents. Amit Bhandari: I think it really elevates it even further. Barbara Lawlor: Yeah. It makes the building gleam, and it really stands out. The stone, the gold hints, like they’ve done a beautiful job. Barbara Lawlor: Yeah. They’ve really managed to make it all come together in harmony. Amit Bhandari: … that, and this is another rare piece of the puzzle. Barbara Lawlor: Of what this building has to offer, and let’s face it, we’re moving away from being a car-centric population. Our young people today are far less car-centric than I was, not you, but than I was. I grew up in a different generation, but I think that the younger generation today, they’re more interested in quick transit ride, get an Uber, a Lyft, whatever is their choice, but they’re so much less interested in owning cars, and I see this in every building that Baker represents, but having direct access to the subway, that’s gold dust. Barbara Lawlor: It really is. Amit Bhandari: That’s a beautiful way to put it, and 100%, I agree with you, and actually, I think looking into the future, not just Toronto, but globally, in, I guess, the top tier cities, I think we’re going to see a lot more reliance on the public infrastructure, and companies like … That’s partly the reason why Uber has formed because of this need. Barbara Lawlor: The need. But I was reading a report recently, and Toronto is number one in Canada for transit system. Barbara Lawlor: Yes. It was number one. I think Vancouver was number two, and Montreal was number … Mississauga was number four, but Toronto was number one, you know, so that’s very exciting. Amit Bhandari: In more ways than just that. I think number one in a lot of aspects. Barbara Lawlor: In a lot of aspects. And there is discussion, and I believe it will come to fruition, that there will be a future connection to the path at the United Bldg. Amit Bhandari: Incredible. I want to talk about the developer now. We know, the industry knows that in today’s climate more than ever, buying from a reputable developer who knows what they’re doing, who have everything lined up, they have the expertise, the resources, they know what they’re doing, now more than ever, it’s so important to buy from a reputable builder. Davpart is absolutely one of them. What can you tell us about Davpart? Barbara Lawlor: I think you’ve made a really important point. In today’s climate, that is really important, who is this developer, and Davpart was established in 1993, which happens to be the same year that Baker Real Estate was established, but it’s really been an honor to work with a group that is so flawless, that is so excellent at what they do, their reputation is wonderful out there in the world, both in Canada and the US, and I’m very proud to represent them. Barbara Lawlor: Well, I think we are privileged because we get to sit at board room tables and contribute with developers, with architects, with interior designers, and a lot of our work, which includes research and just pure sales data drives a lot of the, certainly, what we’re selling in our industry today, and it is what the public wants, whether they are end users or whether they are investors. It is what they want. We know what is the hot seller. We know what the hot sellers are, and that gives us our unique position. So I think we’ve carved out a niche business for Baker Real Estate, and it has stood the test of time and continues to grow. Barbara Lawlor: They’re quite wonderful. There are levels, like the 10th level, the 13th level, the 5th level, they all have amenities, and I think the part that captures me a great deal is that they all lead to the outdoors. Whether it is a promenade, whether it is a lounging area that is beautifully landscaped, whether it is a reflecting pond, a dog run, an area, a zen-type area, there is so much beauty that has been created on all the different levels. Of course, you come inside and you’ve got your 24-hour concierge, and a marvelous reception area. Amit Bhandari: I was going to touch on that, the lobby. Barbara Lawlor: Exactly. Exactly. Amazon, and people just ordering from the internet, people shop on the internet, so a lot of parcels and packages come in, and we’ve got places arranged to take delivery, and people also order a lot of food in and such, like I don’t know, I know there’s foodies out there, but even if you’re a foodie and you love to cook, you still have those evenings where you want to try something that’s international and [crosstalk 00:22:25]. Amit Bhandari: We’re so spoiled, right? Barbara Lawlor: We’re totally spoiled. Amit Bhandari: Especially in that location. Barbara Lawlor: Yeah. We’re totally spoiled. You hit the nail on the head, and I think the amenities in the United Bldg are going to spoil us even more. Of course, they have all the traditional swimming pools and gyms and there’s the latest in the golf simulator, so there’s so much that you can do without setting foot outside your home. Amit Bhandari: I noticed that the amenities package here is pretty spectacular. Barbara Lawlor: Yes, it is. Amit Bhandari: And that’s another thing that you tend to see a lot of, unfortunately. In certain buildings, they sort of shrink it down and keep it to a minimum and whatnot, but here it seems like they’ve gone all out. Barbara Lawlor: Well, you’d have to. With our address, you just have to really do it in a grand style. Amit Bhandari: You touched on the lobby, as well. I think the lobby space has become such an important piece, because it’s essentially an extension of your personal space, your condominium. It’s sort of the first entryway into the building, and so they’ve done a fantastic job. Barbara Lawlor: It’s the first feeling that somebody gets when they enter your home. That’s very important, and it really is like the grand hotels, but it’s far more intimate, and far more residential, of course, but really impressive. Amit Bhandari: The next piece that I’d like for you to talk about is the specifics of the building itself. How tall is it going to be, the general suite mix, how many units are there going to be? Barbara Lawlor: Yes. 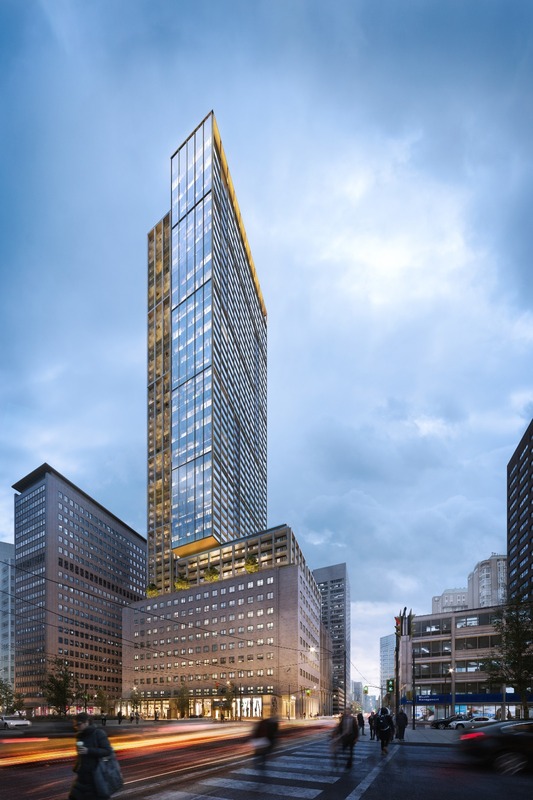 It’s a 55-story tower, and there’s about 700 units in the tower. Now, we’ve designed it so there’s something for everybody, and you mentioned something earlier about people who work in these marvelous hospitals and institutions that are on the avenue, and for that reason, we’re introducing an executive pied-à-terre, which is a studio for somebody who perhaps needs an overnight place to stay, but mostly they’re working, and they’re on-call, but they want to be able to walk a block or so, and just fall into bed, and then come in three hours later if they’re on-call. So there’s that. Amit Bhandari: It sounds like you have. Barbara Lawlor: … have something for everybody, whether you are a first-time buyer, whether you are an investor for the first time, or a long-term investor, and whether you are a buyer who just wants a home, a buyer who has other homes and wants a pied-à-terre. We’ve covered it at the United Bldg. Amit Bhandari: Honestly, TalkCondo, me and my brother, we’re incredibly excited about this development. It’s actually one that I’ve personally been eyeing for a couple of years, because I know it’s been a long time in the works. A long time. Barbara Lawlor: It has, yes. Amit Bhandari: Four, five, six years or so. Barbara, thank you so much. We’re really excited. If there’s anyone that’s interested, any of our investor clients that are interested in purchasing here, what would they need to do? Barbara Lawlor: Well, they need to talk to you and Roy and TalkCondo, because we’ve worked with you for many years. Amit Bhandari: We have. Yeah. Barbara Lawlor: You’re really super at what you do. Barbara Lawlor: We enjoy working with you, and it’s our great pleasure to welcome you and your clients to this really fabulous address. Amit Bhandari: Thank you, Barbara.